Today, six out of every ten American adults use social networking sites, which are bringing new tone and texture to dating. Among social networking site users with recent dating experience (whom we define as those who are single and looking or who have been in a relationship for 10 years or less), 30% have used social media to find out more information about someone they were interested in dating. Another 12% have friended or followed someone on a social networking site because one of their friends suggested they could be a good romantic match. These social media users who are looking for love are particularly likely to be young. Some 41% of users with recent dating experience between the ages of 18 and 29 have used sites like Twitter or Facebook to get more information on a potential date. 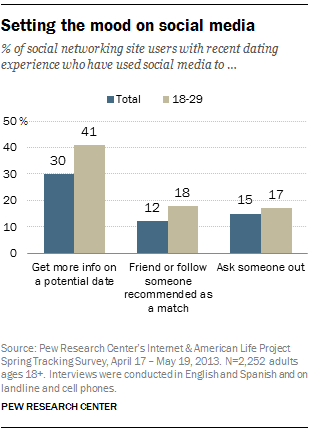 An additional 18% have friended or followed someone from a friend’s recommendation. But survey respondents made clear that sometimes Mr. Right is hidden among a lot of Mr. Wrongs. Over a quarter (27%) of social media users have unfriended or blocked someone who was flirting with them in a way that made them feel uncomfortable. Some 41% of younger users have done so, along with 33% of women (compared with 19% of men). Online daters also described how things progress. Someone catches their eye! They’re ready to go on a date. At that point, 15% of social media users with recent dating experience say they have used social networking sites to ask someone out. Men in this group are somewhat more likely than women to have done this (19% vs. 11%), but otherwise this behavior is relatively consistent across demographic groups, such as race and age. What if things are going well? Time to share some photos! Some 17% of social media users have posted pictures or other details of a date on social networking sites. Almost a third (31%) of those social media users ages 18-29 have done so, the most likely of any age group. But social media can also be a painful reminder of past relationships. Some 22% of social media users have unfriended or blocked an ex; another 17% have untagged themselves from photos taken with an old flame. Younger adults are particularly likely to say they’ve had both of these negative experiences. Some 36% of social media users ages 18-29 have unfriended or blocked an ex and another 36% have untagged or deleted such photos. For some, letting go of a relationship is difficult in a social media world. Almost a third (31%) of social media users have checked up on someone they used to date on sites like Facebook, Twitter or Instagram. This is true for almost half (48%) of those ages 18-29.